We wrap up this week with the letter "M."
M is for Mon Mothma. 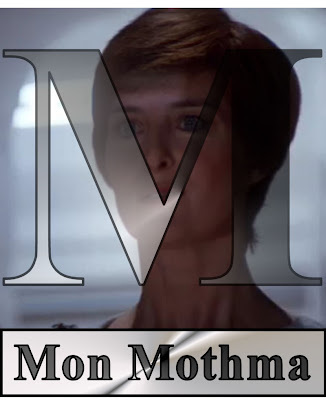 In a sense, Mon Mothma is the anti-Emperor. Like Palpatine, we don't see her until the third movie of the original trilogy (ESB hologram transmission notwithstanding). Like Palpatine, she's in charge. Like Palpatine, she has a memorable presence. But where Palpatine chews the scenery and tells people how great he is and how much of a genius he is for springing the trap that will end the Alliance (which, of course, turns out to be the trap that ends his own Empire), Mon Mothma stands with a quiet confidence befitting of someone who works in the background to unseat a great evil. "The Emperor has made a critical error, and the time for our attack has come." Mon Mothma means this; is still idealistic enough to believe her Bothan spies could shake down the Empire for a crucial piece of information: the plans for the second Death Star and the Emperor's decision to personally oversee the final stages of construction. She only has a few lines, but they are memorable, especially this one: "Many Bothans died to bring us this information." MONDAY: Darth Vader DOES accept apologies! I is for "I know"
A quick Reggie Miller Writing Continuum Update!